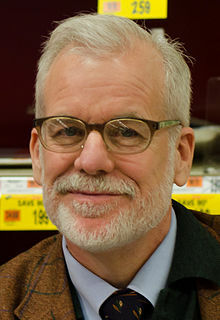 Chris Van Allsburg (born June 18, 1949) is an American illustrator and writer of children's books. He has won two Caldecott Medals for U.S. picture book illustration, for Jumanji (1981) and The Polar Express (1985), both of which he also wrote; both were later adapted as successful motion pictures. He was also a Caldecott runner-up in 1980 for The Garden of Abdul Gasazi. For his contribution as a children's illustrator he was 1986 U.S. nominee for the biennial, international Hans Christian Andersen Award, the highest international recognition for creators of children's books. He received the honorary degree of Doctor of Humane Letters from the University of Michigan in April 2012. Van Allsburg was born in East Grand Rapids, Michigan, the second child of Doris Christianen and Richard Van Allsburg. Van Allsburg's older sister was born in 1947. When Chris was born, his family lived in an old farm house. His family then moved to a new house at the edge of Grand Rapids when Chris was three years old. His new house was located close enough to his elementary school that he could walk there for class. His family later moved again to East Grand Rapids. He attended middle school and high school at East Grand Rapids. Van Allsburg attended the College of Architecture and Design at the University of Michigan, which at that time included the art school. He majored in sculpture, learning bronze casting, wood carving, resin molding, and other techniques. He graduated from the University of Michigan in 1972 and continued his education at the Rhode Island School of Design (RISD), graduating with a master's degree in sculpture in 1975. After graduation, Van Allsburg set up a sculpture studio. While Van Allsburg focused on sculpture, he struggled for time in the studio and began to sketch his ideas at home. His wife thought that his drawings of his ideas would make good illustrations for children's books. After his wife showed his pictures to a children's book editor, he wrote his first book, The Garden of Abdul Gasazi, in 1979. Van Allsburg lives in Providence, Rhode Island with Lisa Van Allsburg, his wife of 43 years. They have two daughters, Sophia and Anna. Van Allsburg has converted to Judaism, his spouse's faith. Van Allsburg has written and illustrated about twenty books. His art has also been featured on the covers of an edition of C. S. Lewis's series The Chronicles of Narnia, published by HarperCollins in 1994, as well as in three children's books written by Mark Helprin. ^ "Chris Van Allsburg". Scholastic.com. Archived from the original on April 12, 2011. Retrieved November 18, 2011. ^ "Caldecott Medal & Honor Books, 1938–Present". Association for Library Service to Children (ALSC). American Library Association (ALA). "The Randolph Caldecott Medal". ALSC. ALA. Retrieved July 22, 2013. ^ "Candidates for the Hans Christian Andersen Awards 1956–2002". The Hans Christian Andersen Awards, 1956–2002. IBBY. Gyldendal. 2002. Pages 110–18. Hosted by Austrian Literature Online (literature.at). Retrieved July 22, 2013. ^ "Biography". ChrisVanAllsburg.com. Retrieved November 18, 2011. ^ Bloom, Nate (November 12, 2004). "Celebrity Jews". Retrieved November 18, 2011.